Those were the extremely honest words JoanMarie used to let me know it was time for a haircut. 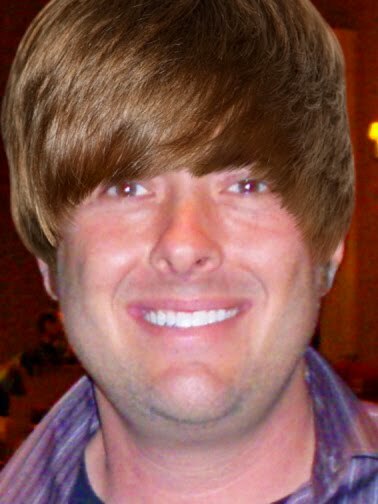 So I thought I'd try something a little more daring this time. I've become a much more spiritual person the past couple of years. The biggest impact this has had on my life is that I no longer worry about ridiculous things anymore. And almost everything's ridiculous when it comes to worrying! Either you do something about it, or you realize that there's nothing you can do about it. While I'm very content and happy with my life right now, there are still plenty of things I want. When my Momma-In-Law stayed with us recently, I learned a new way to think about those wants when she showed me the Gratitude Beads her pastor made for her. Basically, when you find yourself wanting something, you start by turning your mind toward gratitude. You touch the tan beads, one by one, and think about six things in your life that you're thankful for. Finally, you touch the textured bead and ask for what you want. Cool thing is, by the time you reach the textured bead, you realize how much you've already been given. Does that make a difference as far as whether or not your wish or prayer will come true? Probably not. But it will make a difference in how you view the world. There's not much I can say about these 3 book trailers that you won't see for yourself. Acting, directing, editing...get thee to Hollywood! This past weekend, JoanMarie and I went down to Hollywood to watch A Chorus Line. Neither of us had ever seen the show, but we were mainly going to hang out with JoanMarie's friend from college and her family. Turns out, Haley is the sister-in-law of the lead actor in the show. So when it was over, we were given a VIP tour backstage. If you've seen A Chorus Line, you've seen how quickly they change into those sparkly costumes at the end. Those costumes are expensive, so even though I wanted to try on one of the hats, I was also afraid to even touch one of the hats. Live theater is something I always forget how much I love until someone gives me an excuse to check it out again. And then I kick myself for not seeing it more often. But it was fun to leave the backstage area with the lead actor and actress and see the people who do remember how cool live theater is waiting for photos and autographs. Then we all went out for dinner at a Moroccan restaurant where everything is eaten without utensils. It took some time to feel comfortable digging my fingers into a piece of chicken or breaded thing that someone else had touched. But I was hungry, so I got over it. The next day, JoanMarie and I checked out the sites in Hollywood. I recognized about 1 out of every 5 names on the Walk of Fame, compared to 1 out of every 20 for JoanMarie...and I adore that about her! At Grauman's Chinese Theater, we checked out the footprints and handprints of the stars. I, of course, was excited to see that the stars of the Harry Potter films had left their marks. JoanMarie got to put her hand in the exact same spot Johnny Depp had once put his hand! We took an open-air van ride to see spots where movies were shot, some homes where "Old Hollywood" stars once lived, and some "New Hollywood" stars currently live. I'll admit, it felt a tad stalkerish to drive by homes currently occupied by celebrities. Even though they're making millions of dollars, they still deserve their privacy, in my opinion. The best part of the tour was just driving through the neighborhoods and seeing some really beautiful houses and picking up some Hollywood history. I was most excited to see the house where they filmed the original Halloween. We also passed by a house once owned by Bela Lugosi, now owned (but not occupied) by Johnny Depp. JoanMarie: "Did you hear who owns...? Jay: "Yes, babe, I heard." On either side of the gate are freaky looking gargoyles. Of course, a house once owned by Dracula should only be photographed in black-n-white. Finally, we took a stroll through Madame Tussaud's Wax Museum. Immediately, I was recognized by Joan Rivers. Apparently, she's a huge fan of my book, so I gave her an interview. It was hard to tell what she thought of my answers because her expression never changed...which proved to me that she was the real Joan Rivers. Even though Forrest Gump made millions from his Apple stock, he's very stingy with his chocolates. He wouldn't even share the coconut ones! There were several interactive elements to this wax museum, which made it a lot of fun. I was lucky enough to have seen Bob Hope perform live years ago, and I've always been a fan of both his and George Burns. Moments after taking this shot, Mr. Hope threw down a perfect one-liner and I spit my water everywhere. When I repeated the same joke to Jim Carey, he thought I was frickin' hilarious. So I told him, yes, I made it up on the spot. Even though she's pregnant, it was neck and neck between JoanMarie and Lance Armstrong until the very end. The camera didn't catch my skating awesomeness, but Tony Hawk isn't bad, either. It was a long and exhausting weekend, but definitely fun. In fact, if I'd gotten a little more rest earlier in the day, I easily could've won this match. You're so cute, yes you are! Sorry, I'm just so excited that I couldn't string you along like I planned. Here's the proof I was going to show you at the end of this post...which is now at the beginning! 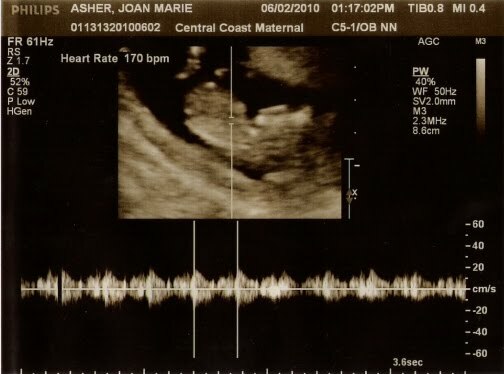 That's what the baby looks like as of this Wednesday, just over 12 weeks into the pregnancy (due date: December 13th). 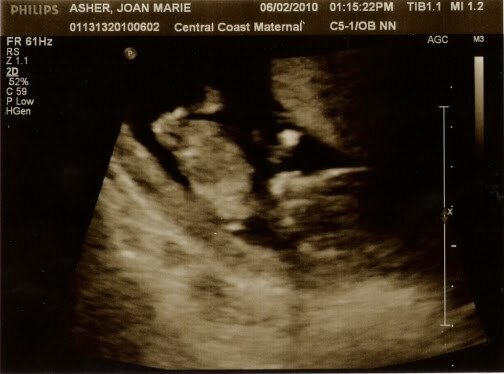 It's not the clearest ultrasound, but some scar tissue still remains from JoanMarie's surgery last November. Remember that? Yep, from surgery to pregnancy, my woman's a fighter! Apparently, so is my baby. To get a better look, the doctor shook JoanMarie's belly (that was weird! ), but my baby decided he/she was having none of that and turned to the side so we could only see his/her back. So here's where I originally planned on beginning this post. (But I was just so excited!) A few months ago, JoanMarie and I bought a new house. Why? Because we wanted a little more room. Room for what? Well, you know for what by now. Here's JoanMarie, doing a very clumsy cartwheel through our living room the night the place became ours. But my friend Ryan and I, minutes later, began ripping that blue carpet out. Within the next few days, we began taping and priming. And here's the almost finished product! Not too much later, after returning from a speaking gig, JoanMarie picked me up from the airport a little late. Why was she late? Because she wasn't done setting up a scavenger hunt. Each clue led me to a new place in our house, where I discovered another clue...and a word. The last clue took me to our bedroom. Beneath the blankets on our bed was a basket with a bottle of sparkling grape juice, some Reese's Peanut Butter Cups (mmmmm! ), and a pregnancy test with an extra blue line, plus one more word. Our friend Brittany recorded the whole thing, and here we are watching my reaction. 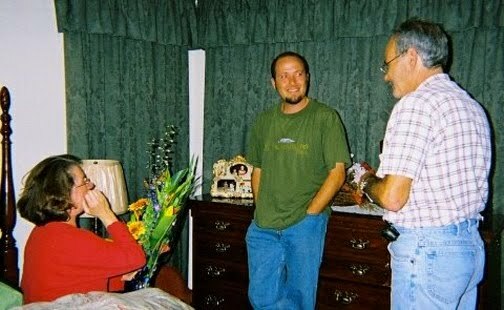 You may remember this photo, taken back in the fall of 2006, when I woke up my mom to let my parents know that I sold my first book. Obviously, it was an awesome night! But there was a slight glitch in the delivery of the news when my mom mistakenly thought, just for a moment, that she and my dad were going to be grandparents. Well, this time, that's exactly what we were saying! JoanMarie and I are starting to learn songs to play to our baby while he/she is still in the womb. Just today, with me on guitar and JoanMarie on piano, we taught ourselves a lullaby version of Sweet Child O' Mine (sorry, Axl). And I've already bought two onesies! Here they are, set atop a blanket with the theme of our new baby room. In case you can't read the one on the right, it says Don't blame me, I just got here. Isn't my baby funny??? I think he/she is going to have my sense of humor!